Boston– May 16, 2013 –Boston Pride is pleased to announce that Mayor Thomas Menino has been named the Grand Marshal of the 2013 Boston Pride Parade. In addition to its Grand Marshal, Boston Pride is honored to announce the late Jeanne Manford has been chosen as an Honorary Marshal. The Boston Pride Parade is a march to celebrate and promote equal rights for the region’s gay, lesbian, bisexual and transgender communities and is the premier event of Pride Week. As one of the most popular Pride Parades in the country, organizations and individuals from around New England and beyond will walk together to advocate for inclusivity, equality and respect. The theme of the Boston Pride Parade this year is “Moving Forward…Proud, Strong, United “and represents the hardships that the LGBT community has persevered through and the drive to move forward together. Mayor Menino was selected through an online vote. A national leader on neighborhood issues and as a strong ally to the LGBT community, Mayor Menino believes that government is about helping people. Elected five times as Mayor of Boston and five times as a City Councilor from Hyde Park, he has spent a lifetime building a better Boston for residents and businesses. 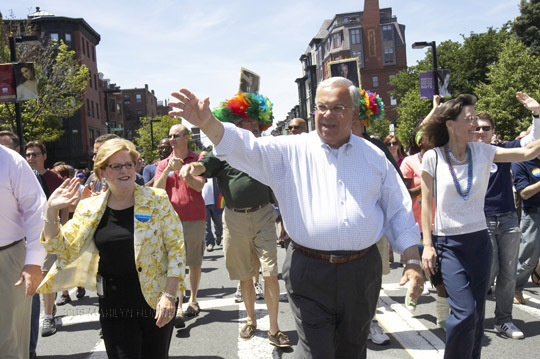 Mayor Menino has always served as a strong advocate and supporter for Boston’s LGBT community.